The Yorkshire Terrier, or Yorkie, was created by the weavers of Scotland who brought him to the Yorkshire district of England in the 1850s. His ancestry is the mixture of various other terrier breeds. He became a fashionable pet during the Victoria era of the late 1800s. He was originally called Broken-haired Scottish Terrier. He was introduced to the United States in 1880. 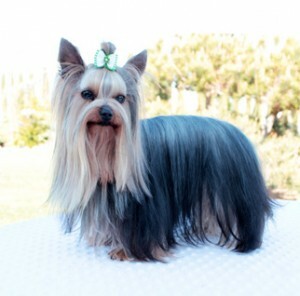 The Yorkshire Terrier is a toy-sized dog with a terrier spirit. He had a sparkling character. He is not intimidated by larger dogs or by intruders into the home. He makes a fine watching and a loving pet. Because his coat is silky and fine, it does require routine attention.